The recent ouster of Dilma Rousseff is more bad news for those concerned about the spread of the Zika virus—and the Brazilian people. I just returned to the United States from Rio de Janeiro, where I was researching a story on the 2016 Summer Olympics for The Nation. People spoke to me about the displacement and police violence that are accompanying the games, yet one of the hottest points of discussion emerged from outside the country: a proposition made by Canadian law professor Dr. Amir Attaran in the Harvard Public Health Review that called for moving, or at least postponing, the Olympics to prevent the global expansion of the Zika Virus, currently exploding in Rio. The Zika virus is primarily spread through mosquitos, and has been proven to cause birth defects such as microcephaly. The World Health Organization has already advised pregnant women to not travel to Brazil, and Dr. Attaran contends that moving the games would slow its transformation into a global pandemic. Yet the favela residents, social activists, and healthcare professionals I spoke with in Rio—none of whom were Olympic boosters—believed this argument to be absurd. As Dr. Rodrigo Brindeiro, director of the Biology Institute at the Federal University of Rio de Janeiro said to me, the idea that isolating Rio and moving the Olympics will keep the spread of Zika at bay “simply does not make sense.” Rio is a global city that receives 5 million tourists every year. One million people came to Rio during Carnival last February, which is summer on that side of the equator as well as the height of mosquito season. In other words, the cachaça is out of the bottle. To be sure, the Zika virus is a serious public-health issue. But it’s important to speak frankly about who is most imperiled and how to stop its spread. It’s not possible to isolate Rio from the rest of the globe. But it is possible to isolate the virus—with changes to public policy. Zika is primarily ravaging population-dense poor communities with inadequate sewage. Wealthy tourists and athletes in hyper-controlled, highly fumigated environments are at a relatively low risk. As Dr. Brindeiro emphasized, only investment in infrastructure, mosquito control, and public-health policy can slow its spread. What is most frightening is how the current political and economic crisis in the country could serve to make the situation worse. Dilma, as she is popularly known, is not above criticism for the various scandals gripping the country—although, compared to the political parties and individuals that voted for her impeachment, she’s Jefferson Smith. 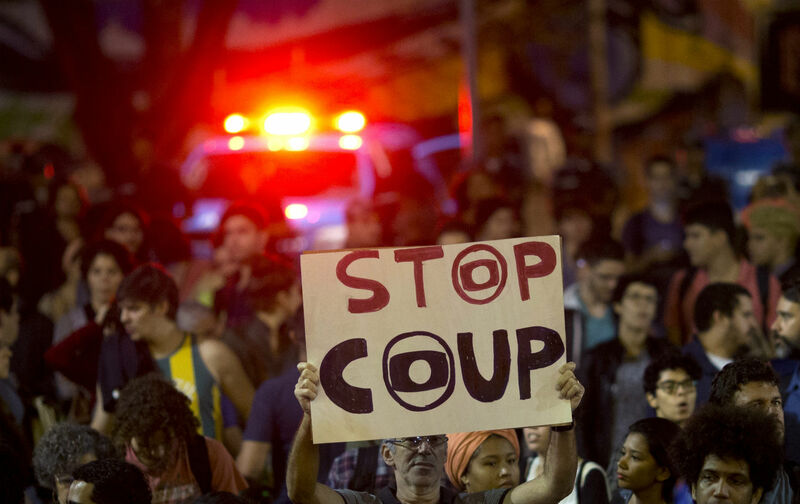 Three-fifths of Brazil’s Congress is currently under some form of investigation. But her removal was not about graft. It was about ejecting a president elected just 18 months ago with 54 million votes because the right wing of Brazil and its powerful backers could not dislodge her at the ballot box. The Workers Party has been in power since 2002, greatly expanding social services and raising the minimum wage in what is one of the world’s most economically unequal nations. The nation’s oligarchy was fine with these reforms as long as the economy continued to hum along with stratospheric growth rates. But with the international drop in oil prices has come economic contraction. Dilma tried to appease international investors with cuts to social services, but all this did was demobilize and demoralize her Worker’s Party supporters, and her own approval rates plummeted to under 8 percent. Brazil’s oligarchs seized the moment and have now removed Dilma, installing her coalition vice president, center-right-winger Michel Temer as the nation’s new leader—a man who, recent polls indicate, would receive 2 percent of the vote if he were running for president today; a deeply corrupt, deeply compromised career politician whom 60 percent of the country already wants impeached. Without anything resembling a popular mandate, Temer has presented a series of sweeping reforms to slash pensions, which would likely cut thousands of government jobs, weakening labor laws and freezing the minimum wage. In an act with no shortage of symbolism, in this most diverse of countries, he has installed a cabinet that is entirely composed of white men: the first time in decades no women have held cabinet posts. Most alarming is the fact that Temer wants to shrink the budget earmarked for public health. Those worried about the spread of the Zika virus should be far more afraid of this regime than of the damn Olympics. This new government has made no commitment to the one action that can curb the virus’s spread: reducing economic inequality and investing in sewage as well as healthcare. Couple Temer’s unelected agenda with the displacement and hyper-militatization, and there are no shortage of reasons to protest the summer games in solidarity with the people who will be marching in the streets of Rio.